The Task Force News Bulletin 13 (February 2015), posted on the increasingly excellent EAAFP website, confirms that for now at least the rapid rate of decline of the charismatic and Critically Endangered Spoon-billed Sandpiper has levelled off. The evidence for this excellent news now comes from the breeding grounds, the staging areas and from non-breeding sites. Major positive contributory factors highlighted in the news bulletin include the head-start breeding program (which entails raising wild-born eggs and chicks in protected enclosures, before releasing birds back into the wild) and a reduction in hunting at the main overwintering site (Martaban in Myanmar). Importantly, however, the news bulletin does not mention that no known major site for this species has been lost to reclamation since Saemangeum, although many smaller sites have been impacted and much of the Jiangsu coast in China (which we now know supports almost all of the world’s Spoon-billed Sandpiper during southward migration) has also continued to suffer various levels of degradation over the past few years. So how many Spoon-billed Sandpiper are there? In 2001, the population was estimated at between 4,000 and 6,000 individuals (down from an estimated 6,000 in the 1970s). The species was then said to have declined at 26% per annum through the decade (which would make an estimated decline in nine years from e.g. 5,000 in 2001 to 445 in 2009 or 331 in 2010). In 2012, the population was estimated at about 400 individuals. No formal population estimate was discussed at the last Task Force meeting in Rudong (Jiangsu, China) in October last year; and it seems that no estimate is included in this news bulletin. However, based on survey effort on the Jiangsu coast (which found 226+ in September and 177-190 in October) and in the wintering areas, the population at the beginning of this year was probably still at least 300-400 individuals. If the estimated rate of decline was correct (and constant), then the species has not declined strongly since about 2009 or 2010. Whatever the rate of decline last decade, this stabilization in number is genuine and it is truly welcome news. It is what many of us have been working towards for years. During the past 20+ years, the combined efforts of many organisations and individuals along the Flyway have helped raise the profile of this species and in the past couple of years especially, in situ conservation work has ensured the survival of some young birds (through the head-starting program) and reduced mortality at selected sites, helping to counter the drivers of decline. There is no doubt that none of this could have been achieved without great personal dedication and effort by many wonderful individuals and organisations and the increased support given to them. The questions of what caused the recent rapid rate of decline, and how to avert future threats remain paramount. 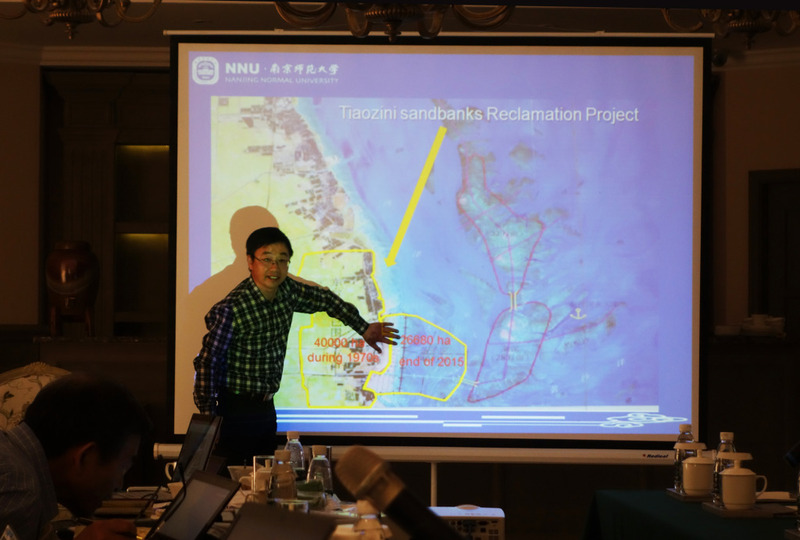 The recent bulletin, in striking a positive tone, only mentions in brief the proposed reclamation of a massive part of the Jiangsu coast, the Tiaozini Sandbanks, due to start (and finish) later this year, entailing the loss of 26,680ha of tidal-flat. And then two subsequent, connected projects, as proposed leading to the further loss of 40,000ha of core habitat by 2020. As proposed, these reclamation projects will directly impact a large part of the most important remaining staging area for the Spoon-billed Sandpiper. It seems possible that these projects could lead to a loss of perhaps 50% or more of the remaining world population within the next five or so years. And it could lead to the loss of an even greater percentage of the world population of the globally Endangered Normann’s Greenshank. Reclamation (the conversion of natural wetland into land and artificial wetland by mechanical means) has of course long been implicated in the decline of the Spoon-billed Sandpiper and other species, though the process of reclamation and its role as the major driver of shorebird declines remains poorly understood. No doubt this is in large part because reclamation is so localized at the global scale, and because it takes place over years and decades, mostly in areas that lack strict environmental protection regulations and strong bird conservation organisations. Few people are funded to research the impacts of reclamation on biodiversity, and until recently, there was insufficient information on where Spoon-billed Sandpipers were, and even on rates of tidal-flat loss and degradation. 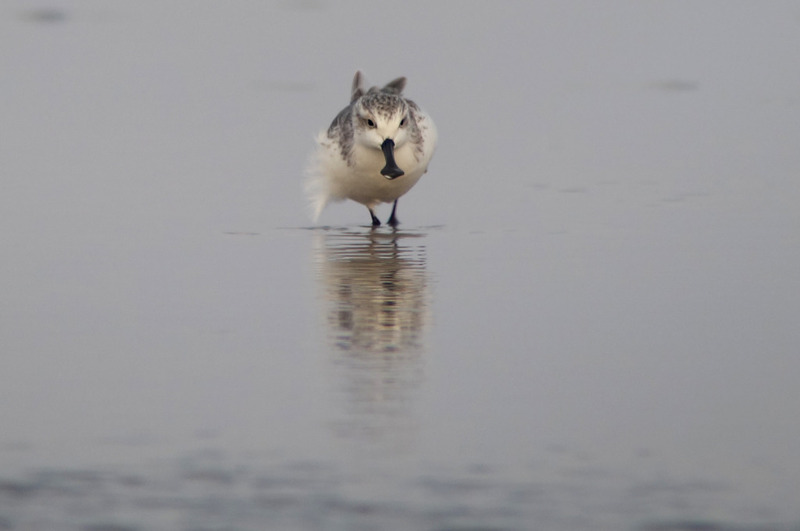 Here in the Republic of Korea, the first large flock of Spoon-billed Sandpiper was found back in the 1970s (in the Nakdong Estuary), and we have known where “our” remaining Spoon-billed Sandpipers were, more or less, from the late 1990s. We have also had to endure the degradation and loss of most of our internationally important shorebird sites, including both the Nakdong Estuary and Saemangeum. We have long had no choice but to look at data generated before, during and after reclamation projects. And as such, we believe firmly that the fortune of the Spoon-billed Sandpiper has long depended on reclamation, especially in the Yellow Sea countries. There is no doubt that other threats exist and do contribute to declines in this and other shorebird species, including hunting, pollution, disease (especially in reclamation areas) and climate change. Stopping hunting of shorebirds at key sites used by the Spoon-billed Sandpiper and other threatened species is essential for long-term recovery, and it is, we must hope, achievable. However, if the likely impacts of further reclamation are to be properly understood, and if much greater effort to conserve remaining sites is to be galvanized, then it seems important to look afresh at that 2010 paper that identified hunting at Martaban in Myanmar as “probably the main cause of the decline of the Spoon-billed Sandpiper”. As I have tried to discuss directly with several of the authors, I believe that this paper was successful in drawing much greater attention to the threat of hunting. For this, the authors are to be congratulated. However, with no disprespect intended, their paper fails to consider seriously (and to refute) any alternative hypothesis to explain the increasing rate of decline in the Spoon-billed Sandpiper last decade. And to support their conclusions, they needed to make several assumptions and to extrapolate from quite limited information. Coarsely put, it appears that if the decline of Spoon-billed Sandpiper only really accelerated during the 2000s and if hunting at Martaban was the only driver of decline through that decade, then hunters there had to catch over 1,000 Spoon-billed Sandpiper in the winter of 2001 / 2002 (equivalent to 26% of 5,000); almost 1,000 in the winter of 2002 / 2003; and hundreds in every subsequent winter. They would even need to have killed 169 in 2009 / 2010 (a winter when survey work, conducted several months into the hunting season, estimated still 200 Spoon-billed Sandpiper in total using the site). The same paper provides an example of four Spoon-billed Sandpipers caught out of a total 1,070 shorebirds to indicate the level of hunting threat there. If this figure is also used as a basis for extrapolation, then over 250,000 shorebirds would have been taken by hunters at this site in 2001 / 2002, to have “bycatch” of 1,000 Spoon-billed Sandpiper (unless of course, this one species was much easier to catch than any other?). As 20-30% of shorebirds were said by the authors to be taken annually by hunters, then again extrapolating, this one site presumably would therefore need to have supported close to one million overwintering shorebirds only 15 years ago, many more shorebirds than at any other known site on this Flyway. Moreover, puzzlingly, if the rapid rate of decline in Spoon-billed Sandpiper only started in the past decade, then hunters would also need to have caught almost no Spoon-billed Sandpiper in any of the preceding decades, even though they apparently must have been catching enormous numbers of shorebirds in order to get the total number of shorebirds down at this site, from more than a million to less than 100,000, as found there in recent winters. There must be other major drivers of decline, because looked at in this way these numbers do not make much sense. Birds Korea is a small organization and lacks expert population modellers and statisticians (if you have those skills and want to support us, please let us know!). And not knowing well, it is unclear, as told to me last year in Rudong, why it is “impossible” to model population change in Spoon-billed Sandpiper against reclamation or degradation of sites used by the species. It seems many of the parameters are now more or less understood. Everyone who has spent time with this species away from the breeding grounds knows this as a bird primarily of sand-flats overlain by silts and mud. The substrates it prefers are highly localized, and found most often in dynamic estuarine systems. Such sites used to include parts of Tokyo Bay, the Ariake Sea, the Nakdong Estuary, Saemangeum (and a few other sites on the west coast of the ROK). They still include parts of the Jiangsu coast, Martaban, Sonadia and some of the Mekong’s river-mouths. Reclamation of such areas will likely have much more impact than reclamation of higher tidal-flat areas not used by the species for feeding. We know too (from first-hand experience) that reclamation of major shorebird sites can take years or decades to complete and that different species respond differently (some more quickly than others) to the reclamation process. The available evidence indicates that reclamation causes increased mortality in northward migrating adults; and very likely increased mortality in juveniles and some birds during southward migration too. Reclamation also means that the site is lost both to those birds that used it at the time of reclamation and also to future generations. Available evidence also suggests that highly-specialised species which are known to be site-faithful to staging sites and non-breeding areas are likely most heavily and quickly impacted. The Spoon-billed Sandpiper is one such species. Furthermore, we also know that reclamation has been going on for centuries, and that it changed in scale and rate in more recent decades. Since the 1950s, we know now that there has been a loss of 65% of the Yellow Sea’s tidal-flats. Much of this loss has taken place in the past couple of decades, with an estimated 1.3 million hectares of tidal-flat lost, almost all to reclamation, in China alone (in Murray, N., Clemens, R., Phinn, S., Possingham, H. and R. Fuller. 2014. Tracking the rapid loss of tidal wetlands in the Yellow Sea. Frontiers in Ecology and the Environment. Published by the Ecological Society of America.). And we know that while earlier reclamation projects mostly took out upper tidal-flat areas (=likely low impact on the species), more recent projects have included damming off whole estuaries, in some cases with estuarine dams (leaving degraded tidal-flat behind); in others, converting the whole system to land (=complete loss of the site to the species). Furthermore, we know that count data during migration suggest that the recent decline of the Spoon-billed Sandpiper might well have started more or less coincident with major modern infrastructural development, first in Japan (especially in the 1960s-1980s), then in Korea (especially from the 1980s, with the completion of several estuarine barrages, and then the loss of Saemangeum last decade). And, it seems safe to assume, now in China. If we were able to map loss of potentially important and known sites against the changes in population, what might we see? I suspect that during the 1960s and 1970s, there would be a series of small downward steps, as relatively minor sites were lost. In the 1980s, each downward step would be larger, with the degradation of the Nakdong Estuary for example leading to a loss of perhaps hundreds of birds from the population (and perhaps, finally, the loss of that part of the population that migrated to the east of the Yellow Sea?). The construction of the Geum Estuarine barrage and the West Sea barrage in the DPR Korea took place the same decade. In the 1990s and especially in the 2000s, we would then see further multiple downward steps, with each additional site lost or degraded leading to further declines, each increasingly obvious as the population was already becoming so small. After the seawall closed at Saemangeum in 2006, a fairly steep decline in the global population of Spoon-billed Sandpiper must have followed even though numbers at remaining sites (like the Geum Estuary) were largely unaffected. In the past few years, we should have seen little change in number, as no major site has been lost. The species is now extremely rare. 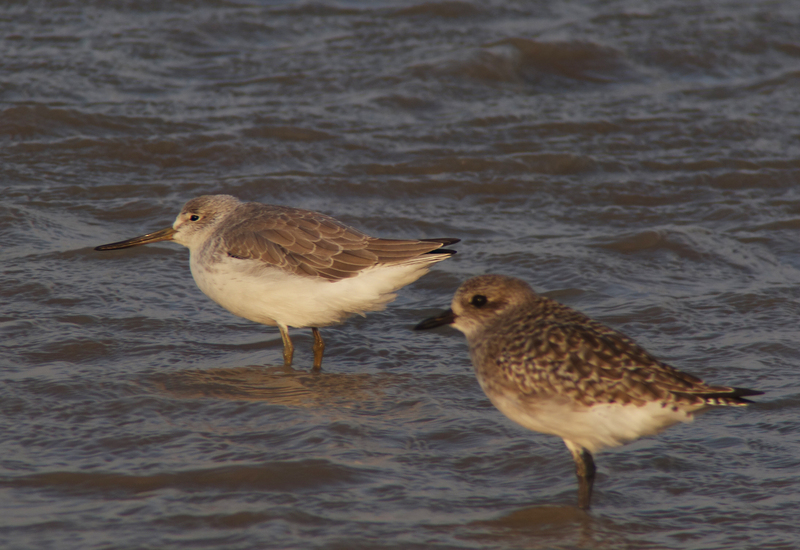 We know the species is now more or less confined to a very few sites; and that the most important known remaining area for staging birds is on the Jiangsu coast. To me, the evidence suggests strongly that reclamation has been and remains the greatest single driver of decline in the Spoon-billed Sandpiper. These declines have been made worse by hunting and other threats. If we want to save this species, and a multitude of others that depend on the Yellow Sea, then first, all of us have to challenge the often misguided rationale behind reclamation, be it economic or social. We need to promote, ever louder, the importance of tidal-flats and estuaries for water quality and fisheries, as carbon soaks and as hotspots of biodiversity, vital to people for livelihoods, recreation and education. We also need to support and defend the decisions made by the conservation conventions, as these should help clarify national and international conservation obligations. And, of course, much more support needs to be given to the local organisations working within region, like SBS in China and Birds Korea in the ROK. Saemangeum is still being reclaimed. The Geum Estuary is threatened with reclamation. The Nakdong Estuary is threatened with airport construction. 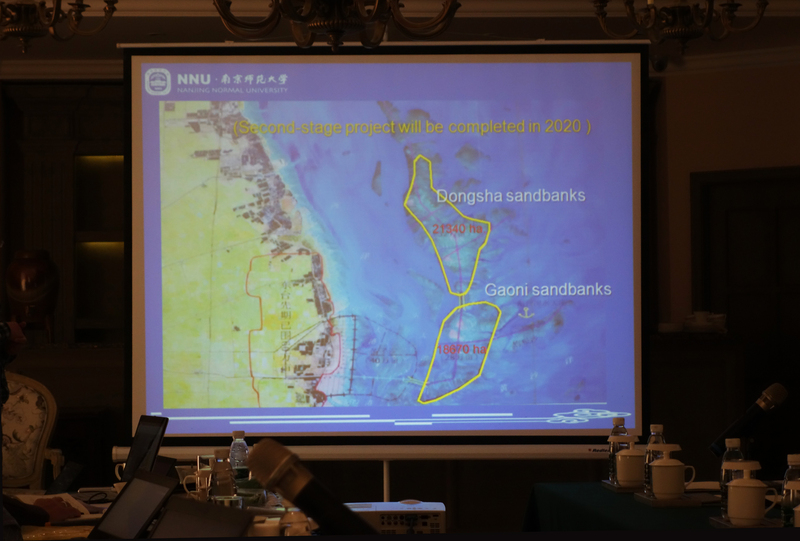 And at this time, SBS in China are in the best position day-to-day and year-to-year to work with decision-makers, helping China and the world to win the protection of the Tiaozini Sandbanks and other internationally important tidal-flats.